Technology has disrupted every industry from transport to finance, and not always in a good way – witness the first fatality claimed by Uber’s driverless car this year, not to mention violent clashes between Uber and taxi drivers in Gauteng. In agriculture, however, the technological tide that has been hailed as the Fourth Industrial Revolution promises to have an altogether beneficial effect – nothing less than the total transformation of the way we farm today in favour of productivity, efficiency, and even fun. We asked Josua Taljaard of Datacentrix to shed some light on the subject. How can the Internet of Things increase agricultural yields? IoT provides real-time feedback and visibility to farmers, enabling quick decisions to address, mediate or mitigate constraints, minimise expenses and increase profitability. For farmers, capitalising on technology means making good use of data and applying intelligence to deliver competitive advantage and business value. IoT is placing farmers at the “Intelligent Edge’, which translates to conserved resources, minimised wastage, increased productivity and maximised yield. “IoT means every action has more context, more intelligence and more automation,” according to Vinay Anand, VP and GM at ClearPass Security, Aruba, a Hewlett Packard Enterprise company. Where can we see the actual benefits of technology deployments in farming? IoT brings more intelligence to every area of farming. This means enabling more efficient operations that are underlined by water and resource preservation; waste management; asset, HR and risk management; preventative maintenance, pest control; and lifecycle management. The potential for these improvements exists across a broad range of agricultural areas, from smart tractors, equipment maintenance, weather monitoring and silo management, through energy management, irrigation monitoring, earth condition monitoring, to security monitoring, livestock monitoring and feed production – each delivering business efficiencies that will enhance competitiveness and ensure future relevance. What are the applications of digital technology for planting, watering and harvesting? The data collection, real-time insight and process automation capabilities of IoT are being proven in agriculture. The sector is already seeing increased production with more accurate planting, watering and harvesting. In water challenged areas, technology empowers conservation by alerting through weather prediction and soil moisture sensors that enable watering only when and where necessary. From their desks, farmers can check and fix solar powered pumps remotely, check water quality and optimise irrigation based on soil and plant needs. Drones, fitted with applicable software, analyse the quantity of crop/plants to evaluate the success ratios within the farmers yield. This data is used to implement corrective actions to secure on-going improvement. And, from a harvesting perspective, the application of artificial intelligence calculates the best fertiliser for optimal crop growth. Are traditional farming techniques on the way out? Forrester tells us that today’s young generation of farmers will be the last to use traditional farming techniques. The next generation will probably never even travel on a gravel road, choosing instead to farm virtually, an option that is actually available to them today. 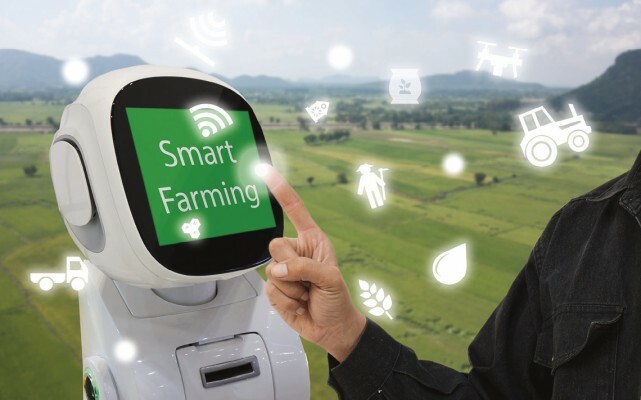 The logic behind smart connected agricultural products and systems encompasses a step approach that starts with connecting and digitising the farm’s systems, moving towards implementing controls, followed by optimising and enabling self-controlled operations, finally ending off with automation. The farming techniques themselves may remain unchanged, but the delivery methodology will evolve from being manual in nature to automated. What does this mean for farm workers? Automation is a shunned innovation in labour-intensive industries around the world. But, automation does not need to be a disaster. Automation increases output, creating new opportunities. Another prominent theme around automation is skills development, resulting in improved workforce skills levels and employment value. Can small-scale farmers benefit too? Many small-scale farmers lack the technology to maximise their yield. Heightened by the lack of connectivity, small-scale farmers are at risk of lagging behind the technology curve. What is key here is government’s role in making the infrastructure, technology and connectivity more accessible to sway the technological impact on our local farmers. How can farmers in rural areas get the necessary connectivity? Connectivity is key to the digital transformational journey, with smart, connected devices at the heart of this process. Connectivity will not just enable the delivery of IoT, it will also allow for greater collaboration between all players within the agricultural supply chain – from the producer, right through to government and the public. Connectivity in rural areas is one of the biggest constraints that we’ve come across in the market. Most local providers have limited capability to provide rural connectivity. We use “software-defined Wide Area Networking” (SD-WAN), a revolutionary capability that enables these sectors to use any connectivity medium and that provides control and visibility to the user instead of the legacy provider. Software-defined networking can change how farms operate, and consume cloud-based services and applications. This increases overall cost efficacy, increases agility and decreases operational complexity. Datacentrix facilitates a path for the agri sector to enter the software-defined world and to realise the profound benefits of software-defined networking. It gives agricultural operations the ability to provide new services and new ways of engaging, and to do this with speed and agility. SD-WAN is clearly a “game-changer” and is going to become the foundation of all future connectivity technologies.